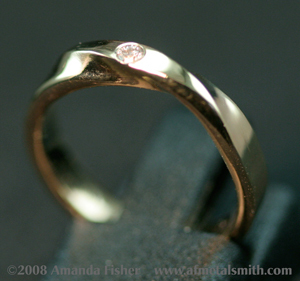 These are several pictures of a 14k Royal yellow gold Möbius ring, set with an excellent quality 2mm diamond. 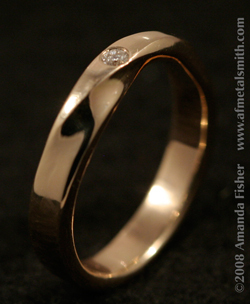 This ring was a commission, and was designed to replace a wedding band that had worn out over the years. I was honored to be asked to create a replacement for a long-term marriage! Below you see some additional pictures of this ring.